The ultimate guide to Ruhpolding ski holidays. Brimming with Bavarian charm, Ruhpolding takes ski holidays and slows them down to a gentler pace – your main ski area’s a bus ride away and in the meantime there’s winter walking, ice skating and a shedload of culture to soak up in the village. This village in the Chiemgau Alps is mighty proud of its Bavarian heritage – locals often wear traditional dress and huge amounts of effort are put into preserving older buildings and structures. It’s a beautiful part of the world, with sloping pastures and forested mountains. Churches and chapels are dotted around the valley floor, with St George’s parish church playing focal point and the village centre’s houses decorated with Upper Bavarian frescoes. In the skiing department, there are three small ski areas locally, with the main ski area - Winklmoos-Steinplatte – reached by car and bus in a few minutes. The nearest airport is Salzburg, 40km away and train travellers can connect to Ruhpolding via Traunstein. Having your own car can be handy if you’d rather not depend on buses to reach the Winklmoos-Steinplatte resort. Look out for the eXtra card, which gives visitors access to a number of local activities and attractions for free. These included the ice rink, Unternberg ski area and Vita Alpina swimming pool last time we checked, as well as free parking in a number of public car parks. The three small ski areas include the slopes of Unternberg, Westernberg and Maiergschwendt. There’s also the bigger Winklmoos-Steinplatte ski area a short drive or bus ride away. Unternberg has a red and blue run from the midstation, with a long red trailing down from Unterberg Alm at 1417m. The crystal piste is an FIS slalom slope, 628m long. Westernberg has a short beginner run, and Maiergschwendt has a kilometre-long blue. The nearest proper downhill ski area is Winklmoos-Steinplatte, which has 16 pistes totalling 44km that cross the border into Austria. The Winklmoosalm area alone has 12km to ski, including lovely blue runs that stream back to the base station. The top of the ski area is Steinplatte, where a choice of three red runs take you back to the chairlift base stations. Your other option is the most challenging piste in the area, black #8, which forks off half way down for added variety. Snowpark Steinplatte by the #4 blue run features a mix of lines for different abilities, and the Triassic Funslope has some brilliant waves, banks and slaloms. While Ruhpolding itself has small offerings for downhill skiers, cross country skiers are catered for brilliantly with 155km of tracks. The après ski is far tamer than the big alpine resorts – here it’s more about friendly, authentic watering holes. Raffner Alm hosts traditional Bavarian evenings with live music and Jeannette and Dirk are known for their band nights at the Holzstube. Don’t miss out on a Glühwein around the fire at Stachus Bar 57, which is right in the middle of the village. Restaurant-wise, Janos has a menu in English which is always handy – choose between pizzas and Hungarian dishes. Bellevue on the edge of the village does delicious local dishes and Mandarin serves oriental cuisine. Der Backer Schuhbeck is a favourite for coffee and cakes and there’s also Gillitzer's for afternoon tea. Salzburg city, the Herrenchiemsee Palace and Fraueninsel island are within easy reach for non-ski daytrips. Locally, activities include snowshoeing, hiking and ice skating. Ask us about the eXtra card which gives access to the sports centre and a number of other things to see and do in the area. When is the best time to ski Ruhpolding? The Winklmoos-Steinplatte area has artificial snowmaking on 47% of the pistes, which is great when snowfall is touch and go at the beginning of the ski season. You’ll find the highest slopes on Steinplatte, which are usually in fabulous condition in the middle of ski season. With no glacier and most slopes under 2000m, late season conditions aren’t the best in the alps but having the eXtra card helps with having things to do in the afternoons. Experience a Bavarian Christmas in Ruhpolding – on good snow years the village has a beautiful blanket of white for the festive season and the Raunacht Market adds to the atmosphere. Ski, snowboard, snowshoe and explore Bavaria during Half Term in Ruhpolding, when the local ski areas are often in excellent condition. Children are treated like royalty in Ruhpolding, a certified ‘Kinderland Town’ with childcare options, family focussed restaurants and more activities than you can shake a stick at! The short transfer from Salzburg airport helps make life easier for parents, who can spend the week exploring the local villages and ski areas. 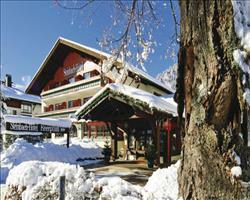 Skiers and non-skiers alike can enjoy a cracking group trip to Ruhpolding. Soak up the Bavarian atmosphere in the village or head off to explore the Winklmoos-Steinplatte area. There are oodles of activities to enjoy together, from snowshoe tours to day trips to Salzburg and other nearby cities.